The Boston fern (Nephrolepis exaltata bostoniensis) is one of the most well-known ferns and admired for its desirable traits as a houseplant. Boston ferns are typically attractive, with long, graceful fronds bedecked with tiny leaves. It is a relatively tough fern, with a higher tolerance for light than other species, and as far as ferns go, they are more tolerant of dry conditions and easy to propagate. An added bonus is that Boston ferns can be displayed in any number of ways, including on pedestals, in hanging baskets, as part of a grouping, or lush specimen plants on the right windowsill. As hearty as this fern is, you still need to give it the proper care. Following a few simple growing tips will help guarantee a beautiful and vibrant houseplant you can be proud of. 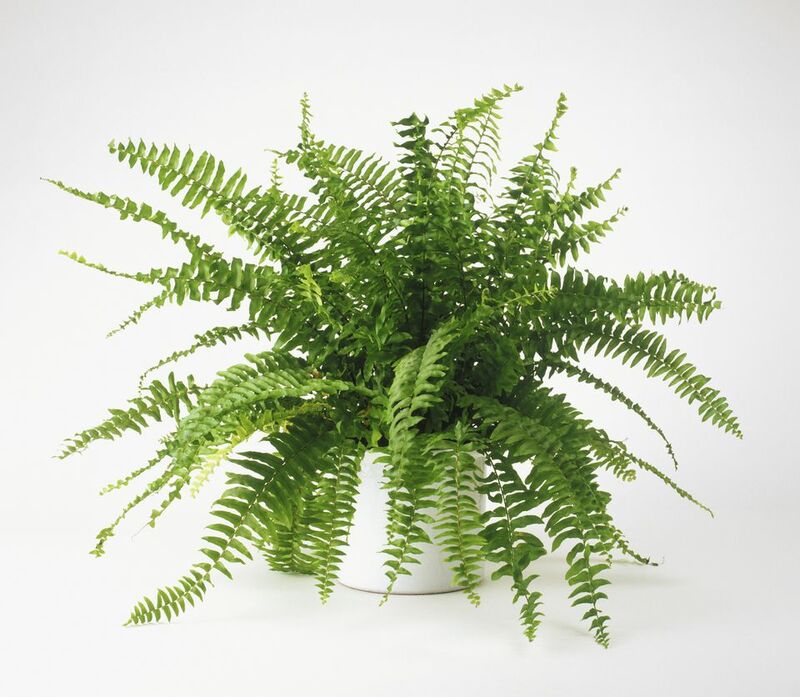 To assure that your Boston fern grows to its potential, you need to create the right growing conditions, including the proper light, amount of water, temperature, soil composition, and fertilizer. Light: The Boston fern needs bright, indirect light. Some varieties of Nephrolepis can be trained to handle almost full sun, but most, including the Boston fern, prefer filtered, dappled light. Water: It is important to keep the root ball moist at all times. If your Boston fern is sitting in somewhat of a dry area (vs. humid), mist with water frequently to keep moist. Temperature: These ferns can survive the occasional blast of cold, down to 50 F or even slightly colder for a few hours. However, they really thrive between 60 F and 75 F.
Soil: Boston ferns need a loamy, rich, organic mixture. Make sure the drainage is good to avoid rotting the roots, which will be evident if the plant is beginning to lose leaves or appears waterlogged. It's a good idea to choose a soil that contains some organic material. Fertilizer: During the growing season, feed the fern with liquid or slow-release pellets. If you're not happy with the fern's progress, it won't hurt to slightly increase the fertilizer within reasonable limits. Nephrolepis ferns appreciate a little TLC. They like to be kept in warm, humid conditions and don't appreciate being blasted by air from outlets or vents. Remove dead fronds and occasionally rotate the plant to keep it growing evenly. During the winter, when the plant isn't growing, you can reduce watering, but your fern should never be allowed to completely dry out. Make sure to maintain a balance of elements for best results—as is true of much of the rest of life, growing the ferns is all about moderation and a sober approach that doesn't overemphasize any one element. In the spring, you should repot into fresh compost, even if your Boston fern hasn't outgrown its pot and it's not necessary to move up in pot sizes. Common signs that a plant needs repotting include overcrowding and wilting leaves, so keep an eye on your Nephrolepis for any tell-tale signs of stress—failure to repot these plants could cause death. This is also a good time to divide plants and multiply your collection. Boston ferns are very easy plants to propagate—simply divide the plant while repotting in the spring. Even very small divisions will root if care is taken with them (meaning plenty of warmth and humidity). Make sure each division has a section of healthy roots. Ferns can also be propagated by spore, but this is somewhat more difficult. There are actually two species of Nephrolepis found in cultivation: N. cordifolia and N. exaltata. N. cordifolia features erect fronds up to two feet long while N. exaltata is the more common variety, including the sword fern, with stiff, upright fronds up to three feet, and the lace fern (or Whitmanii) featuring frilly, ruffled or interesting fronds. Both are N. exaltata bostoniensis varietals, discovered in 1894, which also includes the Rooseveltii.